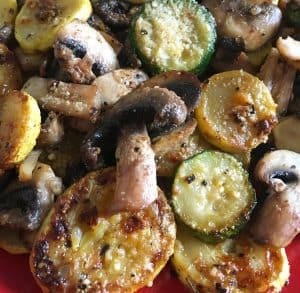 Sautéed Zucchini & Mushrooms – Finger lickin’ good! Vegetables are the perfect side for any meal. So why not whip up some Parmesan & Garlic flavored squash and mushrooms? Garlic and cheese with anything will win me over. Who’s with me? I grew fond of squash after my parents started growing it in our backyard-it’s a versatile vegetable that can be cooked several ways. Today we will be sautéing them with some spices and mushrooms. By the way, zucchini is a type of squash so the two terms are interchangeable. Grab your beautiful zucchini and place on cutting board. You want to cut them to a medium thickness- too thin will absorb too much oil and be flimsy-too thick won’t absorb much flavor. Medium will be just right-you can have an idea by looking at the pictures. Get a large sized pan- add 2 tablespoons of olive oil or enough to coat the pan. Then you want to add the 2 cloves of finely diced. Leave on low to medium heat. Add all the chopped zucchini to the pan. Flavor it with salt, pepper, parmesan cheese, paprika, and the ground basil. Gently mix around to coat all the zucchini slices evenly with the oil and spices. Cook zucchini on one side for 5 minutes or so till lightly brown; flip and do the same for the other side. Once the brown caramelization is achieved on both sides. Take a zucchini out of the pan to test. You want to make sure it is tender and flavorful. I love extra flavor-so I would put more garlic powder, parmesan, salt, and pepper regardless. 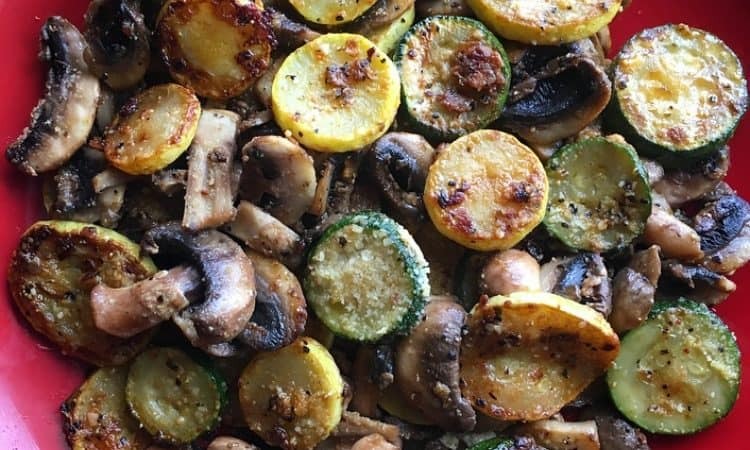 Take the zucchini out of the pan and place onto a plate. Now cut up your mushrooms and add it to the same pan the zucchini was in. Add some olive oil, salt, and pepper and sauté the mushrooms for no more than 5 minutes. 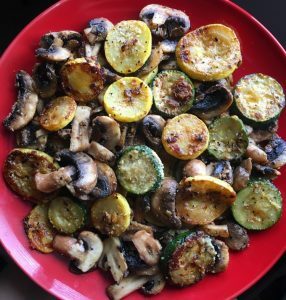 Once your done with your mushrooms; you can add them to the same plate as the zucchini, and you are done!